Roman ruins, renaissance palaces, medieval buildings, piazzas and pizzas, Verona has everything that you are looking for in an Italian city. Nestled on a tight curve of the Adige River, Verona has been an important town since Roman times and is a picturesque city where smart shops and cafes fill the attractive and vibrant historic centre. 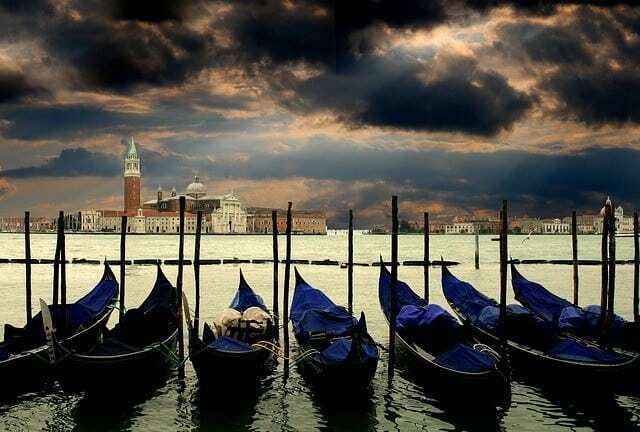 It is a popular place with tourists but doesn’t quite enjoy the international renown of towns like Venice and Florence. 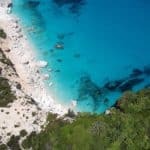 It is well worth a visit and you should think about including it as a stop on a northern Italy trip, or as a destination in itself. In this guide we will share some of the very best things to do in Verona, you will find that there is plenty to fill a 2 or 3-day itinerary. You could wander on your own and see what you stumble across, or join a walking tour that will show you all the main sights and fill you in on the history behind what you are seeing. Just inside the town walls is Piazza Brà, a large open space dominated by the Roman Arena, which now hosts open-air opera in the summer months. We found some great restaurants in the small streets just off Piazza Brà, and the open space of the piazza is great for kids to let off some steam. The Roman Area is one of the icons of Verona standing proud as the focal point of Piazza Brà. It is the second largest Roman amphitheatre in Italy, (after the Colosseum in Rome), and is of an elliptical shape which produces perfect acoustics form any position. It is exceptionally well preserved and is now often used to stage spectacular open-air music concerts and operas – it is pretty cool that a 2000-year-old building is still functioning the way it was intended (ok, so there is a little less blood and death than the Romans enjoyed!). Inside you will find beautiful passages along with the impressive main arena where it is easy to imagine the clash of metal and grunt of bodies that accompanied the gladiatorial battles. There are plenty of interesting facts displayed on information boards throughout the arena. If you get a chance to see an opera or band it must be an awesome venue and the acoustics are great. 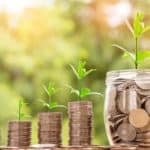 If you are just looking around close to a performance you should be aware that modern staging and seating will be up which changes the ambience a bit. The views from the top of the arena out over the city are awesome at any time. The entrance tickets are 10 euros for adults, under 7’s are free and 8-14-year-olds are 1 euro. 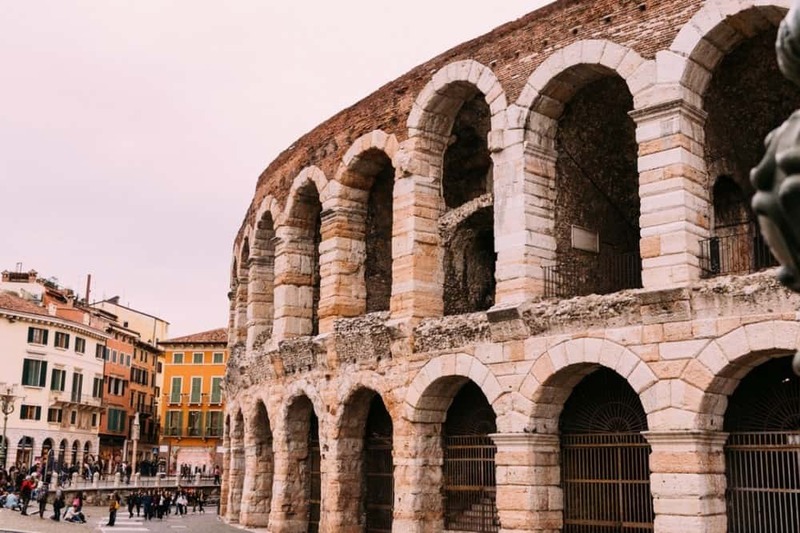 A great value option is to get a Verona Card that grants you priority access to the Arena and many of the other top attractions in the city, along with free use of the buses. Buy a Verona Card here. Piazza Delle Erbe is the oldest square in Verona is one of the most beautiful in Italy with its Renaissance-era palaces and lovely central fountain. This was once the site of the Roman Forum and chariot races, but today it is a far more tranquil with a colourful flower and vegetable market and a wide variety of charming cafes, bars and restaurants. Nearby, you can climb the 283 steps to the top of the Lamberti Tower for lovely views across the rooftops. The tower is an 84-metre medieval bell tower that was completed in 1463. Skip the line with this e-ticket. Scaliger Tombs – Just around the corner from Piazza delle Erbe, are five Gothic funerary monuments that are considered some of the best examples of Gothic art in Italy. They belong to members of the Scaligeri, who ruled Verona in the 13th and 14th centuries. Don’t miss the tiny, lovely church of Santa Maria Antica behind them. If you fancy a bit of shopping then head for Via Mazzini the main shopping street in Verona, which links Piazza delle Erbe and Piazza Bra. 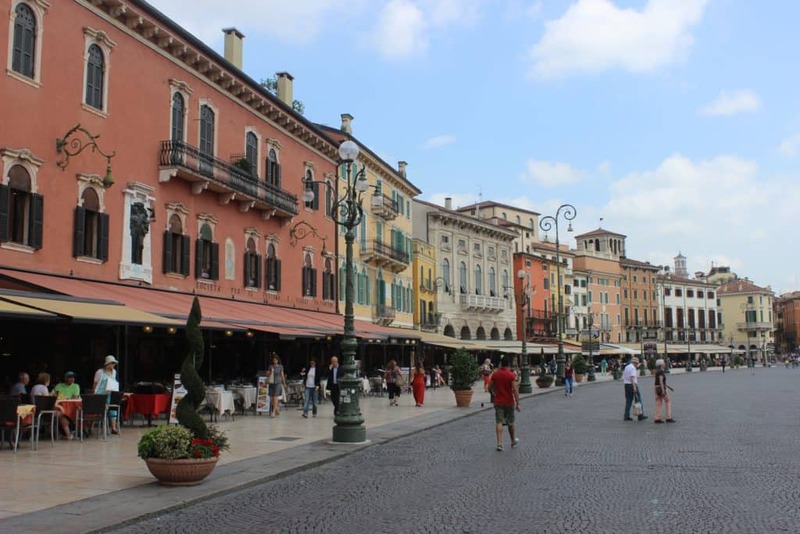 Also known as the “Golden Mile” of Verona, you will find luxury brands and high-end boutiques aplenty. Verona really likes to play up its role as the setting for Shakespeare’s Romeo and Juliet. Casa di Giulietta (Juliet’s House) has no real connection to Shakespeare’s fictional heroine but that doesn’t seem to bother the hordes of tourists that make a pilgrimage here. 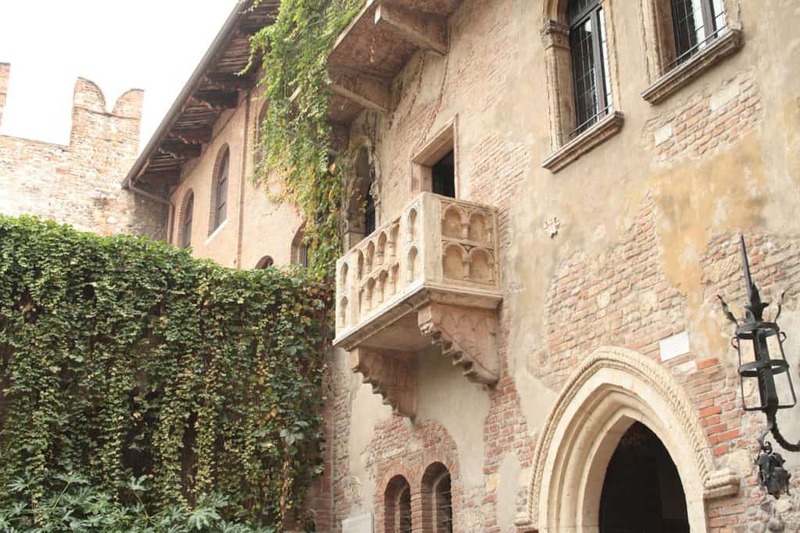 The famous balcony was added in 1936 and the house has turned into one of Verona’s most popular tourist attractions. As well as Juliet’s famed balcony and the bronze statue of Shakespeare’s tragic heroine in the courtyard, the house is also home to a small museum. If you are keen to soak up all the Romeo and Juliet sights and learn about the feuding families that inspired Shakespeare. Try this special tour with an expert guide. 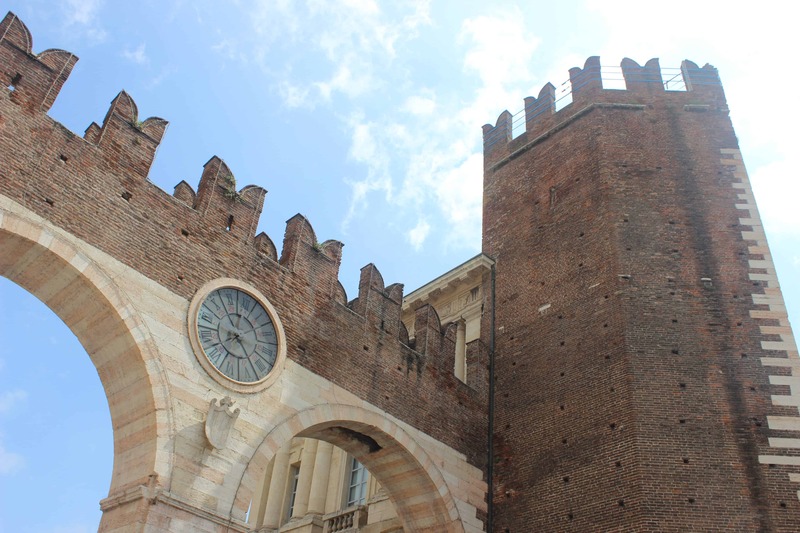 If you are staying a bit longer in Verona you might like to think about some day trips out of the city. One of the best must be the day trip to the often overlooked historic city of Mantua, taking the train. It is a picturesque town surrounded by water with a skyline dominated by ancient towers, turrets, and domes. The town is an architectural gem that has scarcely changed since medieval times (the defensive lakes that surround the city don’t allow room for expansion). It is a quiet but charming place to visit and is free from the crowds of tourists and tacky souvenirs stalls that you will find elsewhere. 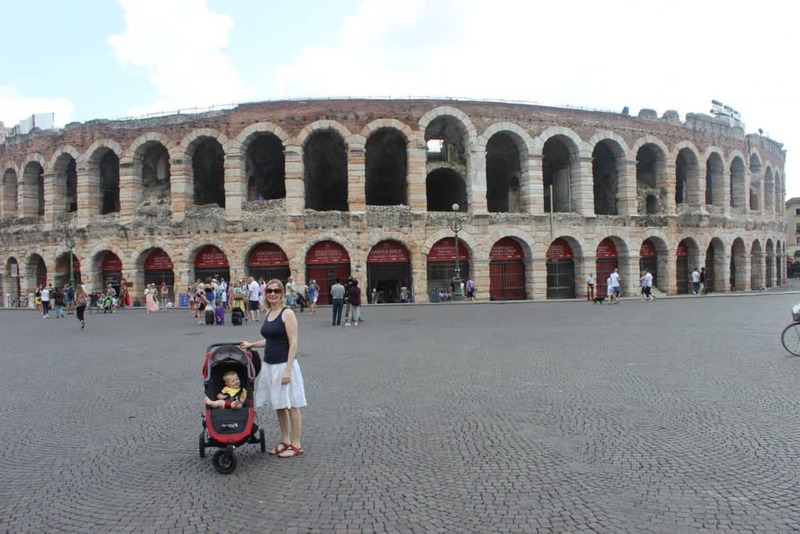 Verona is a great place to visit with kids. 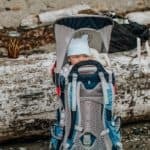 There are plenty of things to hold their interest and the historic centre is pretty compact, flat and well paved (very pushchair friendly). A great activity for all ages is to have a go at making gelato! The traditional Italian ice cream that we eat so much of on all of our trips to Italy. This fun, two-hour lesson is ideal for families who want to have fun learning the secrets of how to make gelato from scratch. Click here to find out more about making gelato. 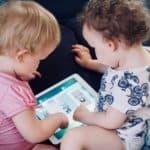 There are quite a few nice parks and playgrounds in Verona so you should be able to find one to entertain your little ones for a bit. All of the playgrounds are fenced off, have benches and shady areas so are perfect places to relax for a while and break up your sightseeing. Many of them have water fountains and toilets. 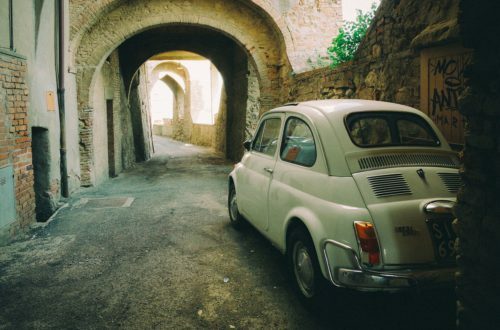 Our favourites include the Arsenale playground, Valdonega, and Raggio di Sole Gardens. The open space and fountains of Piazza Bra also make a great place for young kids to stretch their legs. Check out this map of all the playgrounds in Verona. The indoor swimming pools at Monte Bianco Swimming Centre (Centro Nuoto Monte Bianco) and Belvedere Swimming Centre (Centro Nuoto Belvedere) make a great place to take the kids to on a rainy day (closed Mondays). Gardaland is the best-known amusement park in Italy and has a lot to offer for all ages. 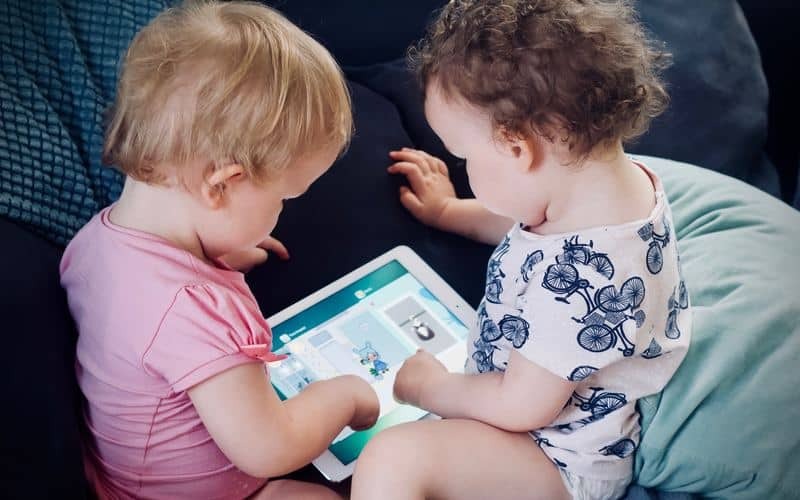 Little kids will love Peppa Pig Land and Fantasy land, whilst those looking for more of a thrill will find a huge range over exciting rollercoasters. It can get busy at the weekend so go during the week if you can. They also have a Sea Life aquarium which is perfect for a rainy day and worth a visit at any time. 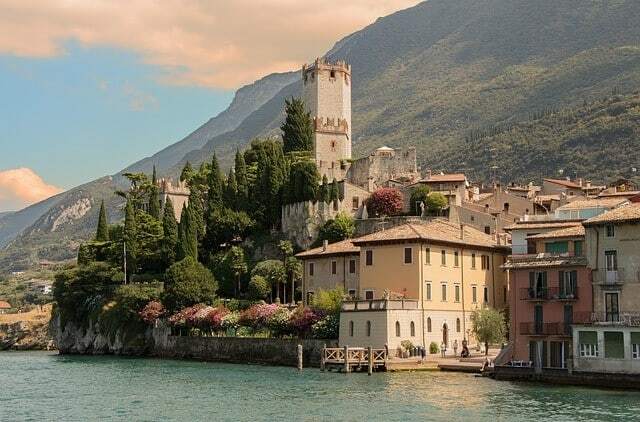 You could spend the day visiting Lake Garda, paddling on the shores or taking a boat trip. There is loads to do there and it is worth a few nights stay if you have the time, if not, this day trip is an excellent introduction to the area. 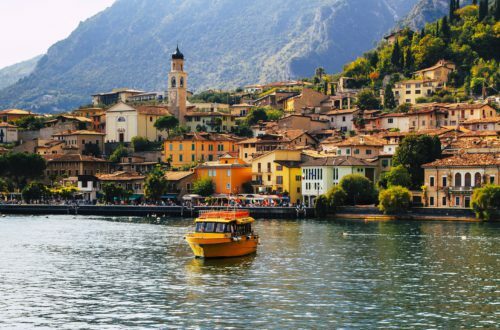 Check out this post for ideas for great things to do at Lake Garda. About 30 minutes outside of the city you will find the Parco Natura Viva. You can easily spend a whole day here driving around the safari park where you can spot animals like giraffes and antelope through your car windows. They also have a normal zoo section where you walk around the animal enclosures. One thing that sets this place apart from other animal parks is the extinction park where you walk around enclosures with life-sized dinosaur models. Our girls just love anything to do with dinosaurs so this is a great extra to have. They also have a fabulous animal-themed playground where you can enjoy a picnic on the benches provided. Verona is easily accessible on all forms of transport. Verona airport is just 12 kilometres outside the city. You can catch the shuttle bus from the airport to the train station, this takes just 15 minutes and departs every 20 minutes. The train station is just outside the city centre so you could continue on foot, or by bus (on the same 6 euro ticket). Or you can arrange a private transfer from the airport to the city centre for a great price. There are good train connections to destinations throughout Italy, and onwards to the rest of Europe. What Will You Do in Verona? We hope that you have enjoyed reading all about Verona and the wonderful things that there are to see and do there. 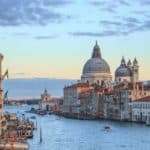 You are spoilt for choice if looking for a city to visit in Italy, there are so many beautiful places to go to, but we feel that Verona is worthy of a visit on any itinerary for Northern Italy. 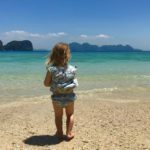 As it is so easily accessible it also makes for a great weekend break destination with just the right amount to see and do over a couple of days without feeling too rushed or running out of things to do. We hope that we have given you some inspiration to start planning your own trip. If you have any questions about Verona, please ask us in the comments below. Love Verona, such a pretty city and we found it a lot quieter than many others in Italy. Looks fantastic! We have never been, but hoping to go to a few new cities on our next trip to Italy! Thanks! It is definitely somewhere that is worth visiting and there are lots of other great places to see nearby as well!